In the winter of 1966, Benoit Duflos designed his very deep-V version Moth and the Duflos would dominate Europe through the rest of the 1960's. 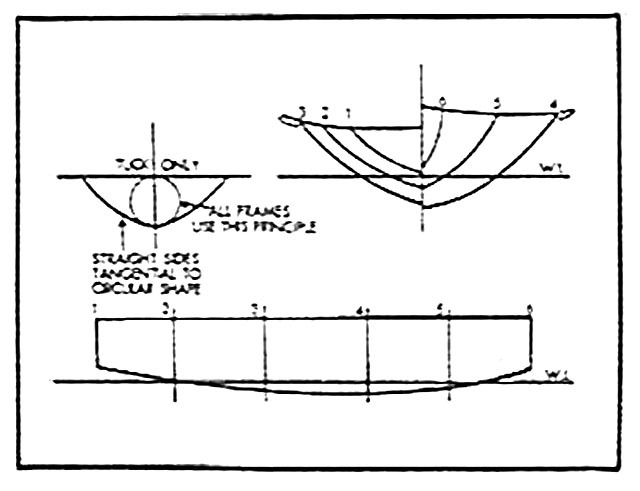 The Duflos was tortured into a shape beyond what you could bend a single sheet of plywood and was built using a horizontal slit about mid panel each side. In 1970, Brit Derek Chester would design the Mistral as a version of the Duflos that could be tortured up. Although in the 1970's, the Mistral design didn't find great success in Europe, the Mistral became the marquee racing design in the American Classic Moth Boat Association from 1999 onward. The lines of the Duflos: (again use the pop-out icon to print or download). 1960's Duflos on trailer (with typical buff body of all Mothies of that age). Some questions about the early history of the very deep-V? In the Swiss fleet, was there some precursor to the Dunand design that showed the way or does the Dunand design all alone represent a radical leap of faith? 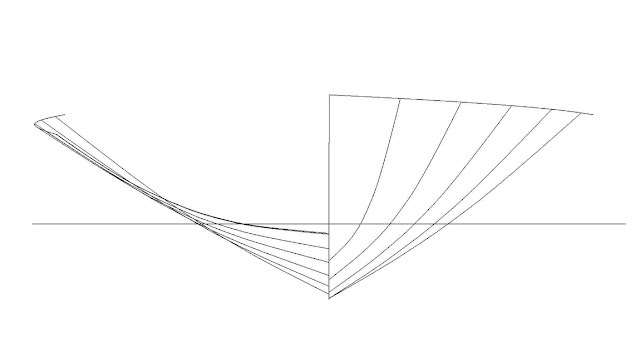 My assumption is the Swiss were initially working off the Fragniere design. There is mention that Jacques Fauroux had a deep-V design in the early 1960's. Where does this design fit into the chronology? Mention must be also made of Chris Eyre's Lucky Sixpence design of 1966. This was another chined deep-V design, though Chris was working with wings in mind and his design had much straighter topsides. who lives just down the road put these comments up, with the blogmeister adding my two-cents worth. One. GA: Warren Bailey's "Mach One" design (World's winner in 1954) had so much rocker in the keel that the forward panels had to be pulled up "pram" style and then a false pointy glass nose was grafted onto the boat to give the hull a sharp stem look. "Mach One" had a deep vee that was similar to that of the Mistral/Duflos and may have been deeper than the Swiss design. The Cates-Florida design is a very watered down version of Mach One. Tweezerman: You make a good point that Bailey's "Mach One" might be considered the original extreme-V. It was definitely considered more extreme than the Cates version that came after the original - but how extreme? Extreme enough to be lumped in with these later designs? I think not, but we only have photos of the "Mach One" to pore over and when I think tamatoo, you think tomato. We do know the Swiss Dunand's came over in 1965 and thumped the Cates. Would they have done the same to the Mach One? It would be correct to say the "Mach One", the "Cates", and the "Fragniere" were deep-V but I don't think the "Mach One" is extreme enough to achieve the reduction of wetted surface these designs achieved. GA: As for whether or not Mach One was a deep-vee, narrow water line boat compared to the Mistral, we'd need access to Warren's half model which his son George has, rather than my memory. I think the most dated aspect of the Bailey design would be the small, pinched transom--a feature replicated on the Cates-Florida design. The Mistral would plane sooner. Two. GA: Duflos' boat was designed in '62 rather than '66. He tweaked the design in '72 to accommodate the the then newly adopted Aussie tall rig. Tweezerman: This is where the history is somewhat muddied. I do have a design list in my archives, listing the Duflos as a 1962 design. I also have in my archives a history that lists the Duflos as a design done in the fall of 1966 and introduced at the Cannes Ski-Sail Regatta, April 1967. I'm going with 1966 for two reasons. If the Duflos was introduced in 1962 it should have been competing with the Swiss Moth and most likely winning. There is no record of that occurring. Also, Chris Eyre wrote a report of the 1967 Europeans where he mentioned the Duflos as a new design, at least new to the English. If the Duflos design had been out for four years by 1967, I don't think anyone would have considered it a new design. GA: I have plans from Benoit Duflos dated 1962. John Claridge:The first [Duflos] I saw in the UK was built for Bridget Quick, again by Bill McCutcheon, in I think 1966. Three. GA: The designer of the Mistral--a clever attempt to capture Duflos' elegant but difficult to build shape, using flat ply panels, was Derek Chester, NOT Merv Cook! The Mistral design went through two versions (we use the Mk II version here) and was followed by the Mirage which while mimicking the Mistral shape was much narrower. The Mirage required wings and even so was difficult to sail in a breeze. Few were built as faster narrow winged Moths like the Stockholm Sprite hit the race course at about the same time. The main appeal of the Mirage was that it was so narrow, one could get both hull panels from a single 4 x 12 sheet of ply. 4. Four. 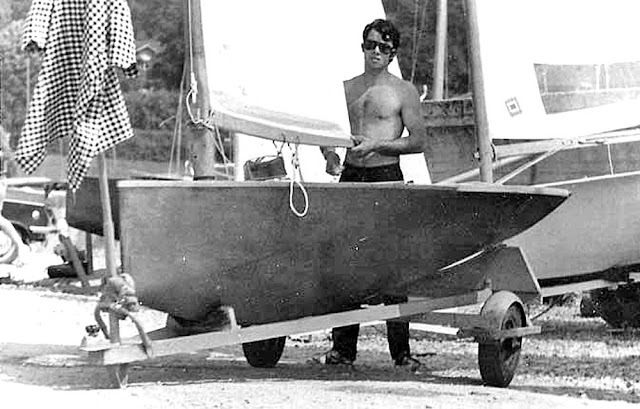 GA: I have never seen any of Jacques Fauroux's boats from the early '60s but several French designers beyond Fauroux and Duflos were building their own boats then. One of the unifying aspects of French and Swiss Moths of this era was the love of the free-standing or "Finn rig" mast. Later on, towards the end of the low aspect era, both Jacques and his sister Marie-Claude were racing Duflos Moths. Marie-Claude is one of two women to win the World's out right. 1971 Fauroux: Neil Kennedy, digging through his extensive yachting library of Nedslocker, sends along this design sketch of the 1971 World Champion Jacques Fauroux extreme-V Moth. For the 1971 Worlds Jacques had done a modified Duflos, with even more rocker than the Duflos and a more circular midsection. He had built her out of 2mm. ply at a hull weight of 22 kg. Width was 5 feet (1.52 meters) with 4 inch (.1 meter) gunwhales. 1. Warren Bailey's Mach One design (World's winner in 1954) had so much rocker in the keel that the forward panels had to be pulled up "pram" style and then a false pointy glass nose was grafted onto the boat to give the hull a sharp stem look. Mach One had a deep vee that was similar to that of the Mistral/Duflos and may have been deeper than the Swiss design. The Cates-Florida design is a very watered down version of Mach One. 2. Duflos' boat was designed in '62 rather than '66. He tweaked the design in '72 to accommodate the the then newly adopted Aussie tall rig. 3. The designer of the Mistral--a clever attempt to capture Duflos' elegant but difficult to build shape, using flat ply panels, was Derek Chester, NOT Merv Cook! The Mistral design went through two versions (we use the Mk II version here) and was followed by the Mirage which while mimicking the Mistral shape was much narrower. The Mirage required wings and even so was difficult to sail in a breeze. Few were built as faster narrow winged Moths like the Stockholm Sprite hit the race course at about the same time. The main appeal of the Mirage was that it was so narrow, one could get both hull panels from a single 4 x 12 sheet of ply. I dragged your comments over to the main post as you raise very pertinent points in this history. I have plans from Benoit Duflos dated 1962. I have never seen any of Jacques Fauroux's boats from the early '60s but several French designers beyond Fauroux and Duflos were building their own boats then. One of the unifying aspects of French and Swiss Moths of this era was the love of the free-standing or "Finn rig" mast. Later on, towards the end of the low aspect era, both Jacques and his sister Marie-Claude were racing Duflos Moths. Marie-Claude is one of two women to win the World's out right. As for whether or not Mach One was a deep-vee, narrow water line boat compared to the Mistral, we'd need access to Warren's half model which his son George has, rather than my memory. I think the most dated aspect of the Bailey design would be the small, pinched transom--a feature replicated on the Cates-Florida design. The Mistral would plane sooner.